We want to celebrate our 30 years in business with a small gift to our customers, so we will be offerring 30% off on all books in stock Wednesday, Feb 25 through Saturday, Feb. 28. We will have a birthday party at the bookstore at 3 PM Saturday, Feb 28, with food and drink, door prizes, and a poetry reading by Simon Pettet. We hope that you will join us for this celebration of bookstore and community, and take advantage of the 30% off sale as well. Simon Pettet will also be reading at Bates College in Lewiston on Thursday, Feb. 26, 730 PM in Skelton Lounge, Chase Hall. Book publishing party for "New Mainers: Portraits of our Immigrant Neighbors" with Photographer Jan Pieter van Voorst van Beest, and Reza Jalali, author of the book's introduction, who says of the book "This project fulfilled my dream of putting a human face on the immigrant community...Often we label people as refugees or immigrants, but they are individuals with very different experiences. This was an attempt to give them a voice." a publishing party for "Brunswick and Bowdoin College" a volume in the Arcadia Press postcard history series, with author Elizabeth Coursen. This morning, while in the barn cleaning donkey stalls, I heard Jayne Anne Phillips on Public Radio, talking about her novel Lark and Termite. Back in the mid 1970s I was a big fan. David Wilk was sending me issues of his magazine Truck, as well as chapbooks that he was producing, and he turned me on to her work. 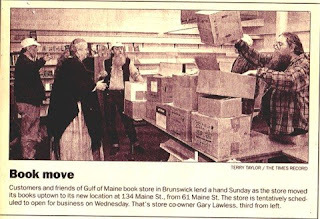 When Beth and I opened Gulf of Maine Books we of course kept her books in stock. Then one year I heard that she would be signing books at the New England Booksellers fall gathering. I looked forward to meeting her and to getting a signed book. I waited in line, and when I reached the front of the line she took the book, signed her name, and slid it back to me, never making eye contact and never breaking her conversation with the publisher's rep who was helping her with the signing. Too important a conversation, apparently, to actually greet a bookseller who tried to handsell her books. I have not stocked her books since. I hope that authors (and publishers) will realize that when you are at bookseller conferences, or anywhere else where you are greeting the public and hoping to sell your book, that it is important to make contact. Let us know that you have seen us, give us some connection to your book. Make us happy every time that we sell a copy for you. 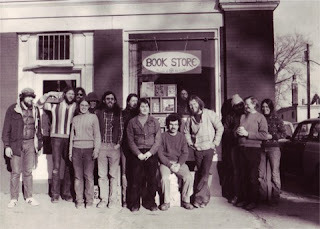 There are still old fashioned booksellers who get a thrill when we sell a good book.